Back and forth, forth and back, the dinosaur opposites go. Some of them are really fast. The rest are really slow! 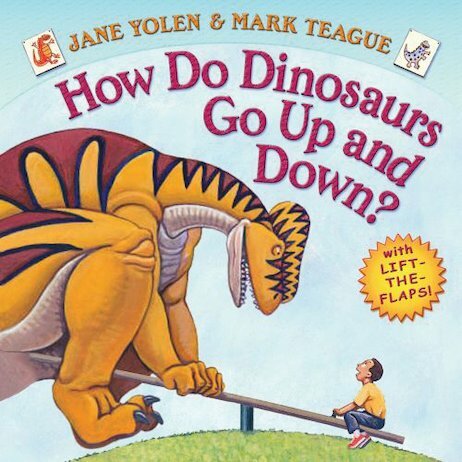 Learn all about opposites in this wonderfully illustrated flip-flap book, full to bursting with mighty dinosaurs and big flaps to lift. Written in uproarious rhyme and full of silly humour, it will delight any child who is trying to memorise and master common opposites. Jane Yolen has won a number of awards including the 1988 Caldecott Medal for Owl Moon. Mark Teague is one of America’s most celebrated author / illustrators. His titles have been delighting children for over fifteen years. He lives in New York with his wife and their two young daughters. Mark Teague’s awards include a Christopher Medal for How Do Dinosaurs Say Goodnight?.